Buy More Stand Up Zipper Top 2.5 Mil Save More! Clear Zipper Top Bags are deluxe, 2.5 mil laminated bags with polyester exterior & polyethylene interior. Composed of 2.0 mil polyethylene and 0.5 mil polyester. User-friendly zipper for easy opening & re-closing. Heat sealable with notches above zipper for easy consumer opening. Polyethylene interior ensures a tamper proof seal. Polyester provides increased heat resistance, high barrier protection, while also increasing the stiffness of the film, allowing the bag to stand up straight for display purposes. 3/8 inch sealed side seams. 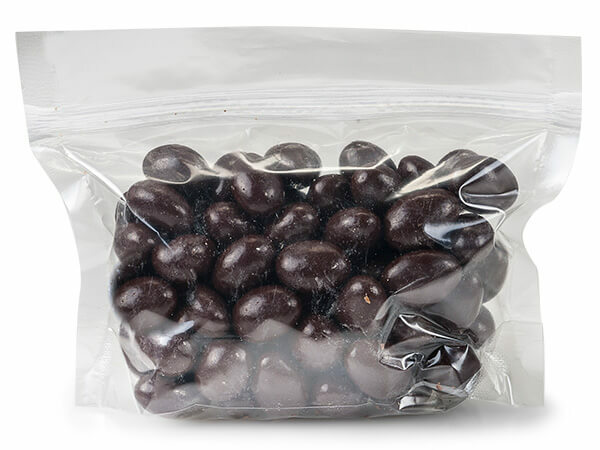 Bags are Saran coated for high oxygen, moisture and aroma barrier properties. Use the thinner 2.5 mil film for your best value. Stand-up bottom gusset for maximum display. Complies with FDA regulations for food packaging.